Do you play chess online or other board games? May we recommend this great site where you can play chess with people from all over the world! Join us at GameKnot.com and play chess with us! Q:Why Gibson Research Corp.'s "Shields Up" test was able to get my real IP address while I was using Multiproxy? A: (by Joe) The problem is not with anything in Multiproxy. The problem was with how I had my browser configured. I had my browser�going through MultiProxy for everything EXCEPT secure web sites, i.e. https:// sites. For secure sites, I had my browser connecting directly. To get to the port scan site at GRC, one must first go through a secure page, which undoubtedly is set up to gather the IP address of the visitor, and courteously I might also add because it is encrypted to prevent the IP from being readable to prying eyes. This is where my IP was gathered. During my pass through this secure site, my browser was connected directly to the site, bypassing multiproxy. I reconfigured my browser to go through multiproxy for secure sites and revisited the GRC port probe site. It recorded my IP as that of the proxy server I was going through. Problem corrected! Q:When I try to access this website through MultiProxy, it won't let me (displays weird message, ad banners, "access denied", etc.). What's wrong? A: The problem is not with MultiProxy, but with one of the proxy servers in your list. Most likely you have one of those filtering proxies that won't let you visit sites with "objectionable" content. Just test each proxy one by one and delete all proxy servers that alter the pages that you visit. Q: I have found a couple of sites which seem to somehow be able see through the MultiProxy shield and detect my correct IP address. Why? A: These sites most probably use Java or ActiveX applets/scripts to detect your IP address. And since these applets run on your local machine, proxy server will not protect you. The only way is to disable Java and ActiveX controls in your browser. Q: What is a Proxy Server? How does MultiProxy improves my Privacy? We have so many gifted programmers these days. The folks at MishkinSoft have created a program that solves the proxy challenge. 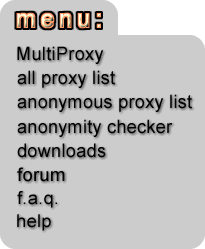 MultiProxy is a free program that allows you to connect through several proxies at once, automatically looking for the fastest ones, anonymous ones, etc. This little trick allows you to connect faster while leaving less of a trail behind you. Get it here => http://multiproxy.org/ it comes with a list of pre-configured proxies installed or you can import a larger list. Open proxies are notorious for being unreliable; the advantage of using several instead of one is speed and reliability. You can leave MultiProxy running on top and watch the connection activity. I usually see at least 3 different IP addresses pulling down one page at a time. Good luck to any site trying to determine my home IP address from that! There are instructions and a FAQ at the site that help you set it up. These settings only work in your web browser, most other programs access the Internet through their own settings. You may have to set up MultiProxy in your dial-up connection as well. Proxy servers are far from perfect and can be frustrating at times, for the most part they do a good job. I keep a shortcut to my Internet settings on my desktop to switch the proxy off if it gives me trouble. So, to tie this together, if you use a web based email account like Yahoo mail and connect through the proxies before you log in... guess what? You can send email almost anonymously. I say almost because nothing is foolproof and you could be traced back to your ISP through some serious log searching. In other words, don't unleash a virus though this method, they will find you.